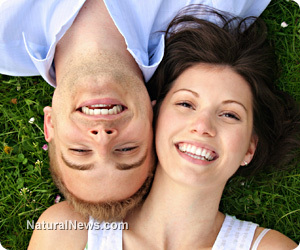 (NaturalNews) A sparkling white smile is more than simply cosmetic - it also reflects the state of inner health. Teeth tend to yellow with age and exposure to staining food and drink, yet discoloration also suggests impaired tooth structure. All in all, light enamel color indicates well mineralized and strong teeth. But before rushing out to purchase a tooth whitening kit in an attempt to spruce up your smile, try a few safe and natural alternatives. Chances are, you will be pleasantly surprised at the results - and your dentist just might be too. Strengthening teeth from the inside not only brightens the smile, it also helps to defend against decay, gum disease and tooth loss. The secret is to consume a high mineral diet that is low in phytic acid. Unfortunately, the standard American diet is high in tooth and bone destroying phytate-containing edibles - namely grains, seeds, nuts and legumes. Even when soaked, sprouted and prepared correctly, these foods still contain enough phytic acid to damage teeth. Add to this high sugar, fruit and commercial vegetable oil consumption and dental health is bound to suffer. Instead, focus on a nutrient rich diet of bone broth, non-starchy vegetables, pastured eggs and high quality fats like fermented cod liver and extra virgin coconut oil along with vitamin butter, a type of fat sourced from pastured cows. Grassfed meats and fish such as sardines and wild salmon are good choices too. Since a deficiency of vitamin D and faulty calcium absorption influence tooth health, consuming adequate amounts of both is crucial. Also, sufficient magnesium and boron in the diet are important as well. Green vegetables are an excellent source of magnesium while avocados, broccoli, celery and olives provide boron. With a high quality diet low in phytic acid, tooth structure will eventually grow strong and white, in turn curbing plaque and decay. Oil pulling - Each day, move one tablespoon of oil (sesame, coconut, olive or sunflower) through the teeth and around the mouth for 20 minutes. Do not swallow - discard the oil when finished and rinse with water. Strawberries - High in malic acid, strawberries help to remove surface stains. Crush several ripe berries and mix with baking soda. Apply with a toothbrush and let sit for five minutes. Brush thoroughly with water to remove paste and rinse well. Use once or twice per week. Activated charcoal - Behaving like an absorbent magnet toward staining compounds, activated charcoal is one of the best methods to safely whiten teeth quickly. Empty half a capsule of powder into a cup. Dip a wet toothbrush into the charcoal and gently brush. Let stand for several minutes minutes then rinse. A sonic toothbrush, the daily use of 3 percent hydrogen peroxide mouthwash and weekly brushing with lemon juice/baking soda all help to fight stains, tooth decay and plaque as well. And don't forget to rinse with water immediately after drinking troublesome beverages like coffee, tea and red wine.